Finally! Predictive maintenance made VERY easy! Significantly increase your plant’s profitability with The AT5™ motor circuit analyzer, which offers a complete electric motor health analysis in minutes. The ALL-TEST PRO 5™ tests all types of motors, including induction, synchronous, AC, DC, brushless DC, servo and wound rotors, as well as single phase motors. The health of all motor components is evaluated, including, but not limited to: induction windings and rotors; DC field windings and armatures; and field and rotor coils in synchronous motors. Single and 3-phase transformers, pole and pad mounted, are also ideal candidates for evaluation with the portable, lightweight AT5™. 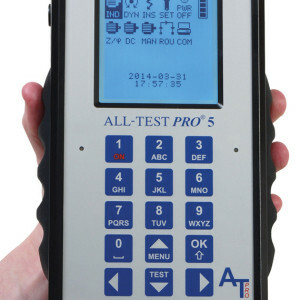 With a memory storage capacity for more than 650 tests, the ALL-TEST PRO 5™ has specific motor trending data accessible at the touch of a button. Test results are easily uploaded to your computer and our MCA Basic™ software provides expert diagnosis, trending, and a wide variety of printed or on-screen reports. Software is available for individual or group users.